The Color Range node allows you to select an specific range of colors in the image. Drag the Color Range icon into the Node Graph. Connect the output of an image node into the image input in the Color Range node. 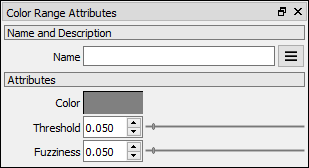 Adjust the attributes of the Color Range node to change the output image. image The Image to be modified. Color The color to be matched in the image.